This is the best and only pasta salad, you will ever need in your life. We can shake on it if you’d like? Here’s why: it literally combines everything you need in a dish, in texture, flavour, colour, nutritional balance and indulgence. Even Masterchef would be impressed. So simple, packed with flavour, born from the simple desire to eat all our favourite things. And whaddya know, perfect leftover-pasta-bestover-recipe (how's that for a tongue-twister): my mum’s Mediterranean Pasta Salad. When I was little I used say with 100% conviction, that I could eat pasta every day for the rest of my life. Now, to be honest I’m not entirely sure it was because I realized that eating that much pasta would in fact cause my digestive system some pain (as I quickly discovered in Italy while WWOOF-ing…), or whether it was because I quickly discovered and fell in love with numerous other ethnic cuisines of which I could now never live without. All this to say, rather to the disappointment of my young self, I am not actually eating pasta everyday. However when I do, and I find myself at home, the following day is almost always followed by a big bowl of bestover Mediterranean Pasta Salad. Easily multipliable for that summer pot luck you’ve been invited to, or even that pic nic your planning, and infinitely variable (see ‘Consume’ notes below the recipe), and will definitely put you in the running for summer entertainer of the year. Now go make too much pasta tonight so you can have it for lunch tomorrow. Bring the pasta to room temperature (to speed up the process pour about a cup of boiling water over the cold pasta, in a pot, and drain. If using freshly cooked pasta, then ignore this step and allow to cool while you prep the rest of the ingredients). Pan fry your bacon on medium-low heat until crispy. Remove from the pan and pat dry using a paper towl. Set aside. 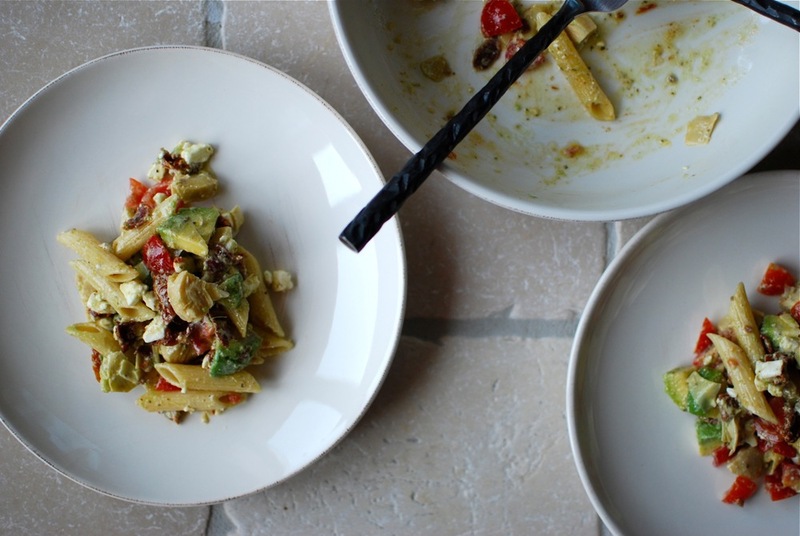 Into a bowl toss your room temperature pasta along with your cubed: cherry tomatoes (half, half, and half again), sundried tomatoes, avocado and carciofini. Next, crumble your cooled crispy strips of bacon and slices of feta (more, or less to taste) into your bowl. To make the sauce, stir together the yoghurt and pesto until smooth, then whisk in the oil until fully incorporated (it will veer slightly on the oily side, much like a salad dressing, so don’t stress too much about its appearance, rest assured it will all come together in the salad). Pour the dressing over the salad just prior to serving, toss until well coated in sauce, and serve. Substitute Feta with your favourite crumbly cheese: ricotta salata, parmigiano. Other vegetables to add in/substitute with: raw courgette/zucchini, blanched asparagus, red pepper/capsicum, celery. For an entirely vegetarian option, top with a handful of salted, toasted seeds (such as a pumpkin, sunflower and linseed mix). Toss in a handful of fresh rocket or spinach for extra greens, and or for fun.